Bedtime With Elmo - Mamanista! My son loves everything Elmo, and it shows. He’s learning his colors. Blue is “bwoo.” Yellow is “yellwoo.” But red is “Elmo.” So I suppose it’s not a surprise that the two of us loved the newest Elmo DVD- Sesame Street: Bedtime With Elmo. This DVD deals with common bedtime issues like being afraid of the dark, not wanting to go to sleep and having scary thoughts in a positive way. The positive benefits of sleep- like dreaming and having energy to play the next day- are discussed. Elmo and Abby don’t want to go to sleep. They would rather stay up and play, but Elmo’s dad helps them conquer their fear of the dark and understand the benefits of bedtime. My favorite feature is Andrea Bocelli singing “Time To Say Goodnight” to Elmo. My son and I enjoy watching this DVD together. He recognizes bedtime rituals like taking a bath, singing lullabies, reading bedtime stories and sleeping with a favorite stuffed animal. 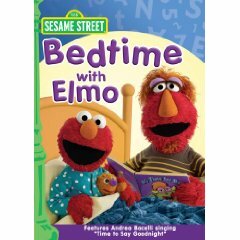 I would recommend this DVD to any Elmo fan as well as to parents who need help establishing a positive bedtime routine or who struggle with young children who do not want to go to bed at night. Watching Sesame Street: Bedtime With Elmo is a calm and peaceful way to end a day. We put it on after dinner and watch it together while we snuggle. When the DVD ends, my son’s bedtime routine starts: bath, pajamas, story/lullaby, and night-night. *Disclosure: We received a review copy of Bedtime With Elmo.